This superb soft cover book contains 220 pages, with over 220 photographs, 30 sketches, several maps, document facsimiles and fascinating statistics. The producers have taken several years to thoroughly research primary source material to write this book, and in the process they have corrected “legends” within the often accepted versions of agricultural development. 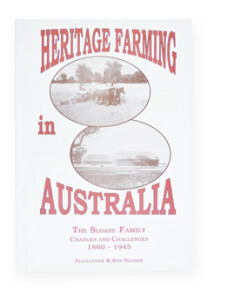 Covering the years 1860-1945, it depicts the challenges and developments within Australian agriculture, personalised through the documents and the photographs of the extensive Sloane family collection. The story of the Sloanes provides a rare insight into the human side of history, and their fascinating tale is woven throughout the book. 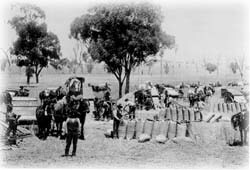 This well known photograph of early harvesting methods has been widely published throughout Australia in books, magazines, calendars and historical publications. In 1977 it was the feature photograph on the widely circulated Denys Lascelles calendar, as promotional material for their wool broking agricultural insurance business. Unfortunately, this photograph has frequently been accompanied by incorrect information. The book provides an accurate account of its history. Back in 1935, wheat was transported in the traditional way of individually sown bags. Yet each of the two share farmers on Savernake Station used contrasting methods, in keeping with their inclination towards old (horses) or new (tractors). After the wheat bags were sewn and branded, they were ready to market. As the wheat carting progressed, the local unsealed roads became dustier, and the wagons were spaced out further avoid the clouds of dust that were stirred up by the horses’ hooves.